April guests Jan and Brad wrote that “the best memories are often made of good friends, good food and a little slice of time to be together. We enjoy our trips to Buckhorn so much. Thank you for making everything so special. We feel like all of you are old friends and we enjoying seeing all of you as much as we enjoy the mountains and the great food.” Wow! That really made the day for these innkeepers. Thank you Jan and Brad (Nashville) and all our great guests! We will be celebrating St. George’s Day on Monday, April 21st with a full English Breakfast. St. George is the patron saint of England and as John Mellor, Buckhorn Innkeeper is English, we like to celebrate this feast day. martyr. In hagiography Saint George is one of the most venerated saints in the Catholic (Western and Eastern Rites), Anglican, Eastern Orthodox, and the Oriental Orthodox churches. 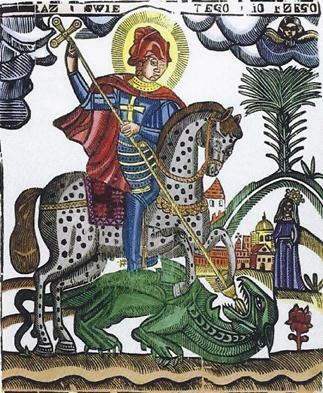 He is immortalized in the tale of Saint George and the Dragon and is one of the Fourteen Holy Helpers. The famous story of George and the Dragon became immensely popular in the West through the Golden Legend, translated and printed by Caxton. The dragon, a local pest which terrorized the whole country, poisoned with its breath all who approached it. Every day it was appeased with an offering of two sheep, but when these grew scarce, a human victim, chosen by lot, was to be substituted instead. The lot had fallen on the king’s daughter, who went to her fate dressed as a bride. But George attacked the dragon, pierced it with his lance, and led it captive with the princess’s girdle, as if it were completely tame. George told the people not to be afraid: if they would believe in Jesus Christ and be baptized, he would rid them of this monster. The king and people agreed; George killed the dragon and 15, 000 men were baptized. George would take no reward, but asked the king to maintain churches, honour priests, and show compassion to the poor. 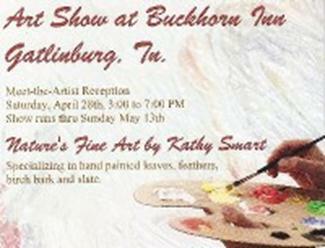 Come to Our Art Show! This is essentially friend fish filets (flounder, cod or some other firm white fish will do) set atop Seafood Gumbo. Heat 2 to 3 inches oil in deep saucepan or deep fryer to 365ºF. Combine flour, water, eggs, baking powder, salt, onion powder and cayenne pepper in medium bowl. Mix until smooth. Dip fish fillets in batter. Let excess drip off. Fry a few fillets at a time in hot oil 4 to 6 minutes or until golden brown. Turn as needed for even browning. Drain on paper towels. Serve atop Seafood Gumbo.